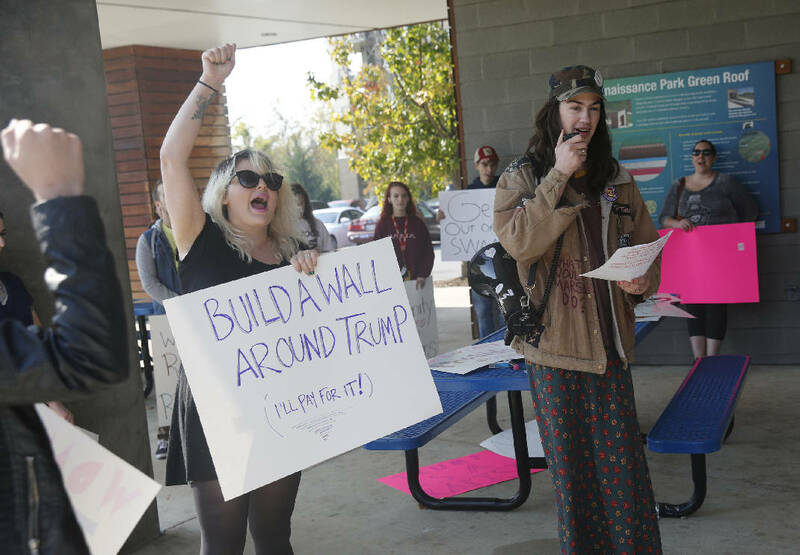 Ashley Williams, left, and Asher P. Larson go over chants with demonstrators at an anti-Donald Trump protest organized by Occupy Chattanooga at Renaissance Park on Saturday, Nov. 12, 2016, in Chattanooga, Tenn. Demonstrators marched from the park to the courthouse downtown to protest President-elect Trump. President-elect Donald Trump might have carried Hamilton County on Tuesday, but the protests against his election already seen across the nation have plenty of local support too. Approximately 50 anti-Trump protesters met in Renaissance Park on Saturday afternoon to practice chanting and sign-rattling before marching over the Tennessee River and through downtown Chattanooga. Aria Taibi, one of the organizers of the "Not My President" event, said she thought it was important to stand with undocumented immigrants and others who may feel attacked by Trump's policies. "We want everyone who is under attack by those policies to know we are with them," she said. She said the protest itself might not change those policies, but hopes the continuing conversation will "incite material change." The Associated Press reported that Not My President rallies drew hundreds of marchers in cities such as Los Angeles, New York and Chicago on Saturday. Another protester, Asher Larson, came to the protest wearing a skirt and a jacket with a large, pink triangle emblazoned on its back. Before the march, he led the crowd in a call-and-response chant. "One, two, three, four, we declare a class war! Five, six, seven, eight, eat the rich and smash the state!" Larson moved to Chattanooga only a few months ago, but said he's excited by the spirits of the people he's met here. "[The protest] shows signs of an anti-fascist movement," he said. "Both sides have failed us and we have to fight back." As the crowd practiced in Renaissance Park, passers-by stopped to stare and talk to each other about the spectacle they were seeing. Two men, Elliot Williams and Jerry Miller, stood at a distance and watched. "I don't get it. It's over," Miller said. "What's done is done. He's the president and we all need to stand behind him." Williams was equally confused about the purpose of the protest. "My biggest thing is, what is their objective? What do they want to accomplish?" he asked. Other onlookers reacted much differently, shouting at the protesters or making hand gestures out the windows of their cars. At one intersection, a man walking in the opposite direction threw a middle finger in the face of several protesters and swore at them. When the group started marching down Frazier Avenue and turned onto the Walnut Street Bridge, two men who asked to remain anonymous filmed the procession with their phones and tried to shout over the protest's refrain. They said vehemently that they disagreed with the message and thought the attitude fueling most of the anti-Trump protests is hypocritical. "I don't recall seeing any 'not my president protests' after Obama won," one man said. "Tolerance is a two-way street." The other man said the nation will just have to wait and see what kind of a president Trump will be. "Hopefully he'll turn out like another Reagan," he said.